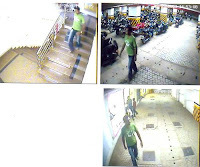 Dakshina Kannada district police have released the photo of a person whao has stolen the two-wheeler, which was used by the miscreants who opened fire at a jewellery shop at Bantwal on 1st September 2009. Addressing a press meet, SP Dr A S Rao said the two-wheeler was traced on the following day of the shoot out incident. However, when the owner was contacted, the police came to know that it had been stolen from Bharath Mall in the city. After collecting the footages from the camera, the police now released the photo. 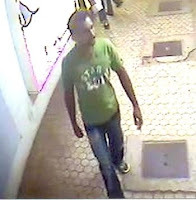 He said the if any one provided an identity of the person on the photo will be rewarded with Rs.10,000/-. Public can contact SP or additional SP directly at 9480805301 or 9480805302.